Driving on winter roads can be a difficult task and sometimes even dangerous. Not every vehicle can provide you with the traction control you need on the road to stay in control and that’s why many drivers are turning to crossovers and SUVs. This vehicle segment offers much more than just excellent control on slick road surfaces, they also provide you with increased passenger and cargo space, excellent versatility and impressive capability. If you want to get behind the wheel of a new crossover SUV with all-wheel-drive in Chicago, IL, Metro Ford has many vehicles to choose from that will fit your specific needs. Keep reading to learn more about some of the best crossover SUVs for winter driving in Chicago, IL. 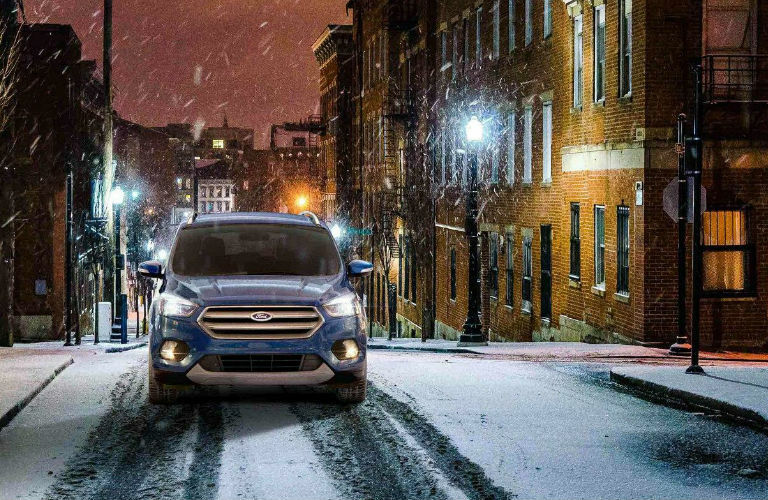 Ford Escape – The Ford Escape is a compact crossover SUV that offers seating for up to five passengers, a spacious cargo area and outstanding fuel efficiency, The Ford Escape also offers the traction control of all-wheel-drive so you can drive with confidence on snow-covered roads. Ford Explorer – The Ford Explorer is a three-row SUV that gives you seating for up to seven passengers and a tremendous amount of cargo space. With its incredible versatility and capability, the Ford Explorer is an easy pick if you’re looking for a spacious SUV with all-wheel-drive in Chicago, IL. Ford EcoSport – The Ford EcoSport is a small crossover SUV that delivers excellent fuel efficiency and available all-wheel-drive. Ford Edge – The Ford Edge is a sporty crossover SUV that offers exciting driving dynamics and performance on the road and the superior traction control of all-wheel-drive. What is the Fuel Economy Rating of the 2019 Ford Escape? This entry was posted on Monday, February 4th, 2019 at 10:27 am	and is filed under Ford EcoSport, Ford Edge, Ford Escape, Ford Explorer. You can follow any responses to this entry through the RSS 2.0 feed. You can skip to the end and leave a response. Pinging is currently not allowed.